Discover this american Bourbon from Kentucky! 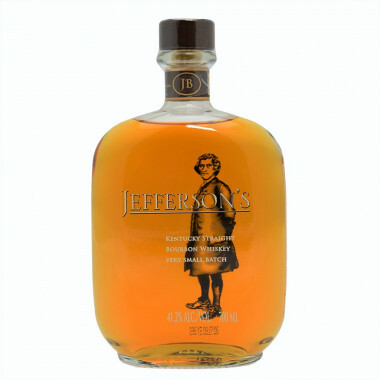 Jefferson's is made of four different Kentucky Bourbons or different ages, it's a straight Bourbon, non peated with complex flavours. Thomas Jefferson is a symbol in the United States. He was a deputy, governor, delegate in the inter-colonial convention, minister of the young european republic, vice president and then the third president of the United States of America 1801 to 1809. The family distillery, based in Kentucky, creates elegant bourbons by making small batches from 8 to 12 barrels which are carefully selected. Each bottle is numbered as well as the batch it is issued from. Taste it fresh for more peachy and vanilla aromas. Jefferson's was created in 1997 by Trey Zoeller and his father Chet. They followed the family tradition which has been lasting for over 8 generations. They chose Thomas Jefferson for the name and image of their brand. He was the third president of the United States of America from 1801 to 1809. He was known for his curiosity and open mind. Indeed, for Trey Zoeller, to made a good Bourbon, you have to be curious, open minded, hardy and surpass oneself. Jefferson's Bourbon is made in very small batches to reveal the aromas of the wood. Nose : fresh moving on peach and vanilla notes. Palate : round and smooth. Finish : delicate and warm on woody and vanilla notes.